Sometimes we just need something to talk about. It doesn’t have to be pretty or complicated or even accurate. But this is why it is important that we, as futurists, need to provide tangible outputs. An artefact of the future. Recently I was fortunate enough to present a short talk on future trends to the Disruptive Futures: Nuclear Weapons Summit in Santa Fe, New Mexico. The summit was the brainchild of Santa Fe Creative and supported by the Nuclear Threat Initiative and NSquare. I was there as a World Future Society Fellow. Using the brief as an example, I would like to illustrate one way we can produce artefacts of the future. Firstly I was asked to provide a ‘brief on the future trends’. Talk about an unbounded, massive topic! Where do you start and, perhaps more importantly, where do you end? Given the central topic of the summit was nuclear weapons, and my military background, I felt I should tie the trends into a single cohesive theme. For me, the most dominate trend in human history that is unlikely to change is conflict. The history of war is the history of humans. I realise this is a pessimistic outlook and probably stems from spending 20+ years anticipating, planning and training for low probability, high impact events. However the conflict is fuelled by three mega-trends: (1) lack of resources; (2) decreasing state power; and (3) decreasing relative power. I realise that most of you are well aware of these trends so please bear with me as I articulate them. Firstly, and simply, a decrease in available resources results from demand outstripping supply. Increasing demand is a function of a population explosion and an increase in disposable wealth. Fortunately the rate of growth appears to be dropping. Supply is decreasing because either the resources are finite – take lithium, gold and oil for example – or global warming is creating circumstances where the most basic resource, land or water, becomes unusable. As the temperature increases, our ability to produce renewable resources like food crops becomes severely hampered. 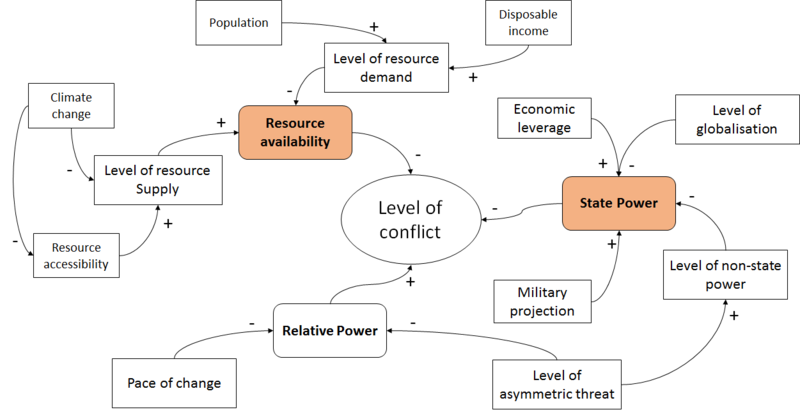 A decrease in resources directly increases conflict. The power of the state has been an important factor in constraining war – to a point. The dominance of the Westphalian state is increasingly being eroded. The Westphalian model, agreed to in the 1600s, recognised and constrained state power to geographic territory. The predominance of the state within its own territory is now being challenged. Firstly non-state actors, such as large private or semi-private companies, are becoming more influential in national and international decision-making. The processes of globalisation are, at the same time, forcing states and people to integrate faster than their diverse and sometimes opposing interests and values can adapt to—politically, socially or institutionally. As a result, trust between nations and governments, and between governments and their citizens, is diminishing. 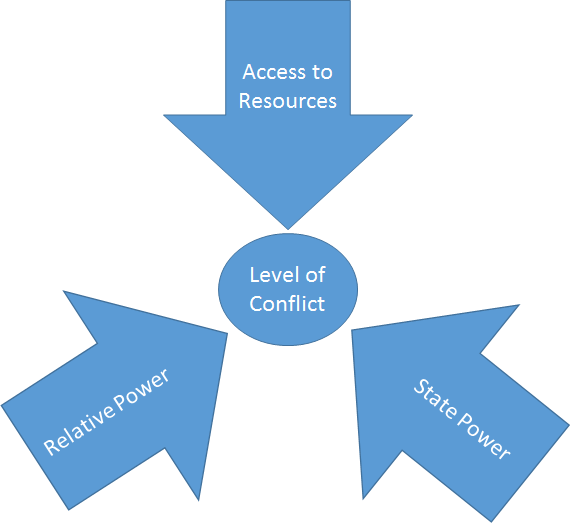 Decreasing state power directly increases conflict. Relative power is decreasing. By this I mean the relative military and economic power of the state against the non-state actors. This is driven by both by the inability of large state-based bureaucracies to adapt to pace of change and the proliferation of technology. The most significant areas of technology development are likely to be in areas of ICT, sensor / networking, behavioural and cognitive science biotechnologies, materials and the production, distribution and storage of energy. We are already seeing a vastly increased capacity in areas of directed energy applications, nanotechnology, hypersonics, robotics and artificial intelligence. This includes automation through to autonomous technologies, agile manufacturing and geospatial technology. The proliferation of long-range precision weapons as well as weapons of mass destruction, and emergent forms of warfare such as cyber and space warfare, will provide state and non-state actors with a range of ways to escalate and expand future conflicts beyond the traditional battlespace. The decrease in relative power directly increases conflict. Without an artefact though, this brief is just words running through your head looking for the nearest exit. Remember the dominate trend was conflict and these trends influence the likelihood of conflict. As you can see, these trends are fairly simple to visualise using, in this case, simple influence diagrams. I say simple because the complexity of this issue would require far more variables than we have time for – and I haven’t even developed the relative influence response delays. I guess that is the point though. You should look at this diagram and say – ‘but Leon, what about …?’ This diagram is now an artefact. It is certainly not correct in every detail and it most certainly does not accurately represent the emotional trauma that results from this topic. However. It is translatable into a variety of different mediums and provides a base level of understanding. I can change it, improve it and talk about it. I can start talking about levers of change, indirect and direct influencers and even start to craft simulation models. It stimulates consensus, discussions and ideas. This idea about artefacts actually stems from design thinking models. Perhaps later we can talk about what we can learn from both design thinking and strategic thinking. In the meantime, what has been your experience?